Thoracic outlet syndrome (TOS) refers to the clinical features that arise from compression of the neurovascular bundle within the thoracic outlet. The signs and symptoms that arise can be divided into neurological* (nTOS), venous (vTOS), and arterial (aTOS). TOS typically occurs in middle aged patients and is more common in women and muscular individuals. It usually occurs in the setting of hyperextension injuries, repetitive stress injuries (e.g. work-related, particularly when working over the head), or external compressing factors (e.g. poor posture), but can also be secondary to anatomical abnormalities, including that of the 1st rib, an anomalous cervical rib, or bands within the thoracic outlet. There are several mechanisms that can cause thoracic outlet syndrome, most commonly due to rib anomalies, muscular anomalies, or a result of injury. 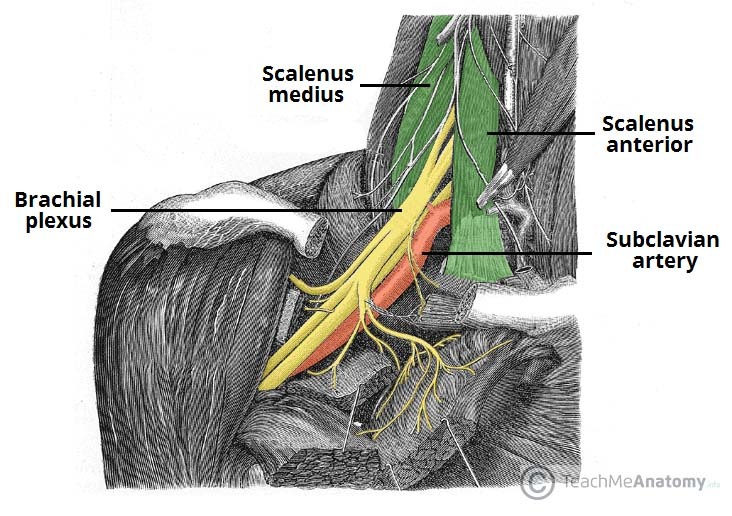 The brachial plexus and subclavian artery pass through the scalene triangle, the subclavian vein anterior to scalenus anterior. The brachial plexus can be compressed between the anterior and middle scalene muscles, or against the 1st rib or a cervical rib, typically with the lower cord being irritated (thus causing symptoms in the ulnar distribution). Repetitive stress injuries and hyperextension injuries of the neck can cause acute spasm of the scalene muscles, haemorrhage, or swelling of the scalene muscles, which in turn narrows the thoracic outlet. Likewise hypertrophy of these muscles can cause compression in bodybuilders. 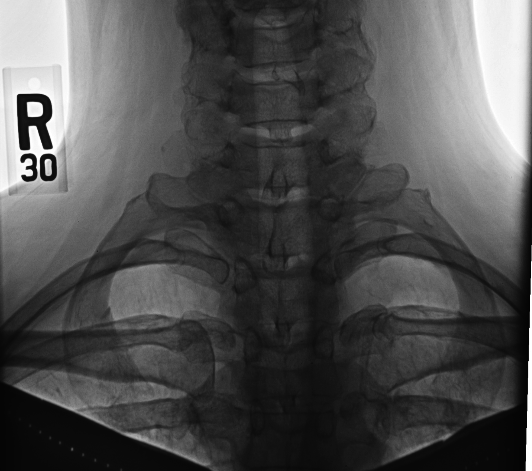 Cervical ribs can predispose patients, especially after hyperextension-flexion (whiplash) injury*. Moreover, the presence of a costoclavicular ligament can reduce the costoclavicular space, leading to vTOS, due to positional venous obstruction. Following trauma, healing processes from clavicular fractures can also cause extra bone formation that compresses the neurovascular bundles. *The absence of a rib anomaly makes the diagnosis of arterial thoracic outlet syndrome less likely, however the 1st rib can have prominent muscular attachments that compress the artery. The specific clinical features present will be dependent on neurological, arterial, or venous involvement. Symptoms may also worsen with certain movements, e.g. shoulder abduction or extension. Compression of the brachial plexus can cause paraesthesia and/or motor weakness. Venous compression can lead to deep vein thrombosis and extremity swelling (termed Paget-Schrötter syndrome). Arterial compression can cause claudication symptoms or acute limb ischaemia. On examination, assess for areas of weakness or numbness, for swelling or tenderness, and any features of limb ischaemia. Tenderness over the scalene muscles is often present. Adson’s manoeuvre – Palpate the radial pulse on the affected side, with the arm initially abducted to 30 degrees. Ask the patient to turn their head and look at the affected side’s shoulder, before fully abducting, extending, and laterally rotating the shoulder. Any decrease or loss of pulse is suggestive of TOS. Roo’s test – Abduct and externally rotate the shoulder on the affected side to 90 degrees, bend the elbow to 90 degrees, then asking the patient to open and close the hands slowly over a 3-minute period. Worsening symptoms will develop if TOS is present. Elvey’s test – Extend the arm to 90 degrees, with the elbow extended and wrist dorsiflexed, then tilt the patients ear to each shoulder. A loss of the radial pulse or worsening symptoms is suggestive of TOS. Initial bloods should be taken, including FBC and clotting screen (further specialist haematological testing may be warranted later for further assessment). For venous or arterial TOS, common tests used for diagnosis include initially a venous and arterial duplex ultrasound study, particularly with the patient at rest and with the arm in stress positions to look for any compression. CT imaging or a venogram may be required for further assessment. The treatment approach depends upon the type of TOS. Treatment is indicated only for symptomatic patients; the presence of a cervical rib or other rib anomalies does not indicate intervention. Patients with vTOS may need thrombolysis and anti-coagulation, under guidance form the haematology teams, however in long-standing cases, surgical management via venoplasty or venous reconstruction may be required or the placement of a venous stent. If any evidence of aTOS with acute limb ischaemia, then urgent vascular input is required. However, most cases are causes by anatomical abnormalities that can be managed in the elective surgical setting. Surgical procedures should be considered if conservative measures do not work or anatomical variations require correction. For decompression, there are 2 described approaches, either supraclavicular or transaxillary, to excise the first or cervical rib, with release of any restrictive bands and the anterior scalene muscle if they impinge on surrounding structures. Physiotherapy remains an integral part of recovery after any surgical intervention for TOS. Complications of TOS surgery include the neurological or vascular damage, or haemothorax, pneumothorax, or chylothorax (particular on the left, the thoracic duct is within the thoracic outlet can is at risk of damage). Left untreated, TOS can lead to further sequelae of the pathology, including permanent nerve damage, aneurysmal dilation of the subclavian artery leading to embolisation, or loss of limb function. Prognosis in neurological TOS is variable, whilst that of vascular TOS is largely favourable after appropriate surgical intervention. In some cases, especially nTOS, symptoms can persist despite aggressive physiotherapy and surgical intervention. Symptoms can recur from 1 month to 10 years after surgical intervention. Which of the following is not a terminal branch of the brachial plexus? Which of these is a special test used in the assessment of thoracic outlet syndrome? What is the mainstay of initial treatment for uncomplicated neurogenic TOS? An otherwise well 30year old male patient undergoes transaxillary surgical decompression for left side TOS. Post-operatively develops progressive dyspnoea, with no other specific symptoms. On examination, the chest is dull to percussion on the left side. Which of the following is the most likely diagnosis?